Tokkuri Tei is a popular spot. One step inside the place, and you can feel the buzz. 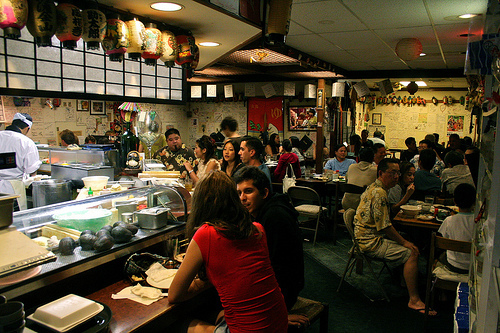 It’s got something of an authentic izakaya style going on, although paradoxically it is not one of these places the Japanese tourists flock to in throngs. Well, that depends on what you order. The menu is pretty expansive, even for an izakaya, and I don’t think any cook staff could maintain a level of quality across so many dishes. Most of what we ordered was on the disappointing side, though there were a couple hight points: the sushi (the nigiri, not the California roll, which was about as ordinary as it gets) is up there. We tried the maguro, unagi, hotate and ikura – all superb. Also, as I usually do, I asked the wait staff for a recommendation, and from what she pointed out we went for the salmon skin tofu salad. An amazing dish with really good quality, creamy tofu. Next time I’ll order more of the favorites. Here’s the thing, though. When the bill came, it was about the same as what we paid at Miyabi, which just might be Honolulu’s best Japanese restaurant no one’s ever heard of. Even if everything had been as good as the sushi, Miyabi still eats Tokkuri Tei for breakfast. No contest.